This week on SoundNotion, the panel is joined by clarinetist and director of the Los Angeles New Music Ensemble, Christina Giacona. Their new album will be out in September. We whip it (and the news) as best we can and find the details in 8-bit video. This week on SoundNotion, the panel is joined by clarinetist and Los Angeles New Music Ensemble director, Christina Giacona. These guys rock! Their new album is out in September and will feature some Gameboy jams by Joseph Eidson. The new London Contemporary Music Festival will have both kinds of music – FREE and awesome! SCANDAL! The Met is caught red-vocal corded(?) using body mics during a dress rehearsal. Coursera has teamed with the Curtis Institute of Music and signs up 24,000 for music appreciation. #FoTS Rob Deemer ponders the power of video integration in new music education and performance. We ponder Rob’s ponderings. 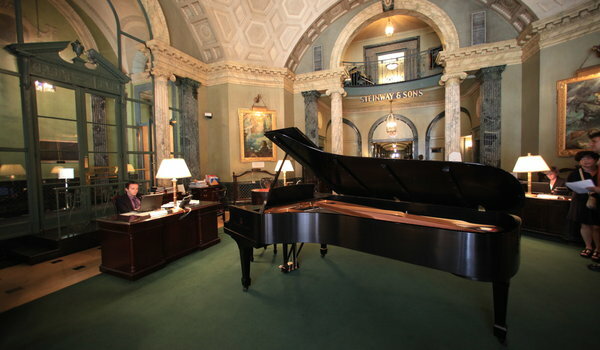 Steinway finalizes sale of West 57th Street showroom. Joseph Eidson‘s MINIBOSS, perf. Los Angeles New Music Ensemble – Sorry, it’s not available yet. Stay tuned to LANME’s site for an update about the release later this year. We’re joined by music critic Vivien Schweitzer to discuss trends in music criticism and how someone always thinks you’re an idiot. PLUS-Minnesota cancels season, Baltimore’s new duds, New Music USA’s new grant system and we say goodbye to Steve Martland. This week on SoundNotion, the panel is joined by writer, musician, and music critic Vivien Schweitzer to discuss trends in music criticism and how someone always thinks you’re an idiot. Oh, and she can’t wait to write about this concert. Cue the diminished chord! The Minnesota Orchestra cancels the remainder of their current season as labor issues persist. #FoTS Drew McManus doesn’t have high hopes. But not everyone is sad in Minnesota. The St. Paul Chamber Orchestra is back to work. Parsons The New School for Design has finished its project to revamp concert wear for the Baltimore Symphony (using students at Mannes College as models). Get a full rundown of the new duds here. New Music USA has overhauled its grant system; we think for the better. #FoTS Rob Deemer has some thoughts on this and similar moves in the UK by Sound and Music. Don’t take candy from strangers, unless that is, you want to promote American composers. Lucy Mann is still going strong at 92. This week, the music world says an unexpected goodbye to composer Steve Martland. PLUS – The SoundNotion crew is sure to impress with its entry for #ritenpr, part of NPR’s The Rite of Spring centennial celebration. Release your inner choreographer and give it a try.